We aim to have at least one steam loco operating as well as 'diesels'. Light refreshments, ice cream, souvenirs etc., are usually on sale. We offer clean toilet facilities, including disabled access and baby changing. A wheelchair accessible carriage is available on request. 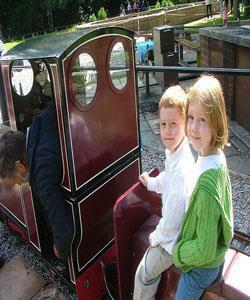 Admission is free, the railway fare is only £1.50 per person per ride. You are welcome to bring your own picnic but please take your litter home with you as we have no refuse collection service. Printed timetables are available for you to take home. Please park at your own risk in the field - access to our premises by vehicle is strictly limited to disabled badge holders and members of the Society. Our 5" and 7?" gauge ground level track is fully signalled and interlocked for added interest and passenger safety. Our elevated track caters for almost every gauge from 0 up to 7?". All carriages are 7?" gauge for stability. 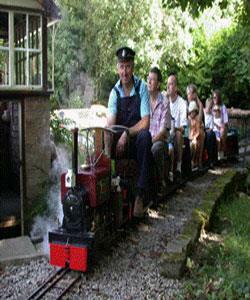 We have a dual gauge 32mm/45mm 'Garden Railway' for steam or battery powered locos. Visiting model engineers are warmly welcomed. Appropriate public liability insurance is needed. If bringing a steam loco or traction engine, a current boiler certificate is required. Passenger rolling stock is vacuum braked. Public running is intensive so you may prefer to visit on one of our club only days. Please contact us first if you intend visiting. Visitors please note:- our tracks have a 30ft minimum radius so may not be suitable for certain locomotives. Opens 1pm-5pm on scheduled open days (see timetable) from March to october. Also Santa special events in December. Accessible by Public Transport: Dore and Totley station is 0 miles away.